Save your items for an upcoming rummage sale to earn money to fight the EIR! Date to be determined: May 19 in Pollock Pines or July 22 at Placerville Fairgrounds. or send to me (Joanne) at moonlitwater2001@yahoo.com. 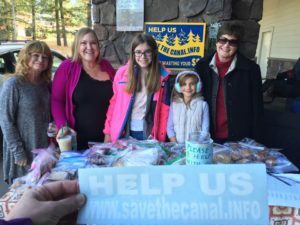 December Bake Sale was a success! New meeting date posted! Picture request! Bake Sale:December Bake Sale helped add to our total for fighting the EIR. Meeting:A new meeting date is March 12 at 6:15 at the PP-Camino Community Center. 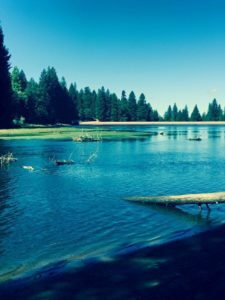 Pictures:We’d like any pictures you have which show Forebay Lake before it was logged. Thanks for looking! Old pictures are fine, like this one showing trees on the south side of the lake and in the valley past the dam. Thank you, Erika Larsson for this image. Bring to the meeting or contact Joanne Abram at moonlitwater2001@yahoo.com for how to share your photos. November Bake Sale was a success! Thank you to all the hard working volunteers and bakers! 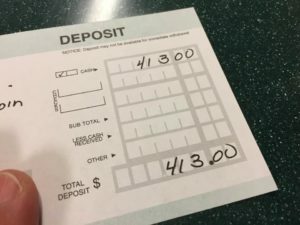 We were able to add $413.00 to our legal fund! 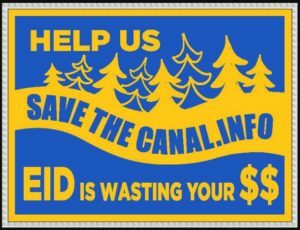 New signs for Save the Canal are out and showing up all around town. Get yours and help spread the word! Next meeting is on Monday, November 27 at 6pm at the PP-Camino Community Center, 2675 Sanders Dr., PP.